Either run mysqldump (or mysqlbackup if you have an Enterprise licence) from an operating system scheduler, for example in Linux using "cron" or in Windows using the "Task Scheduler". This is the most commonly used option. 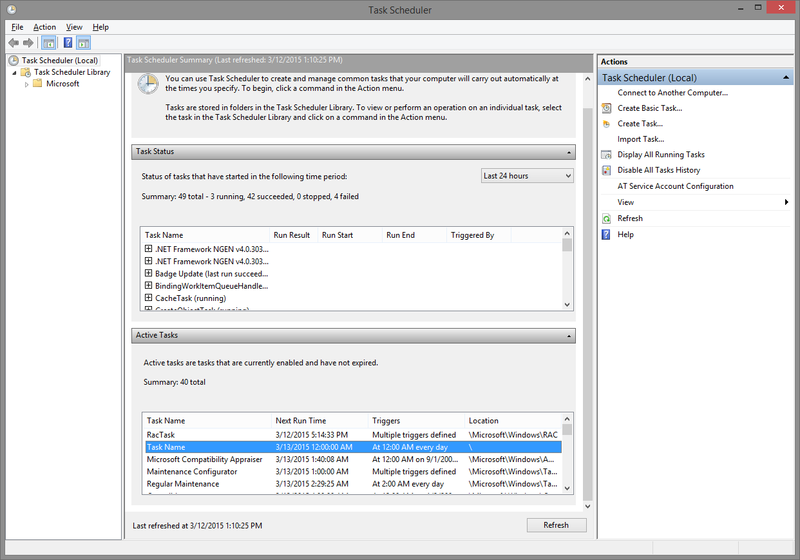 Task Scheduler runs to a trigger: Start up, event or similar. It does not really run on demand. It does not really run on demand. You can just run a batch file on demand by running it from the desktop (batch file saved on the desktop) or from within a command window. Right, more progress - looks like it might be a path problem I've put a pause in the batch file, and when run through the task scheduler, it says:'mysqldump is not a recognized program'. However when run through the command line on my user account it works fine; just to confirm, I've set it run on the same user account I've been testing it on. When configuring task scheduler to run the SharePoint management shell it opens as windows powershell not in SharePoint management shell. The script I made is running well under SharePoint management shell but not in windows powershell. I would use Windows Task Scehduler/cron (depending on your system) and mysqldump. Scroll down in the link, it includes some insights how to achieve what you want. Scroll down in the link, it includes some insights how to achieve what you want.